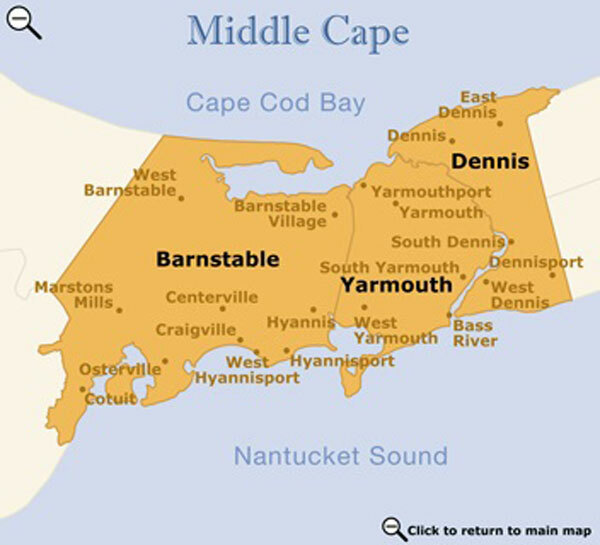 The Mid Cape includes the city of Barnstable and the towns of Dennis and Yarmouth. There are seven villages in Barnstable: Barnstable Village, Centerville, Cotuit, Hyannis, Marstons Mills, Osterville, and West Barnstable. Barnstable is the county seat, and Hyannis is known as Cape Cod’s one and only metropolis. The Mid Cape runs from Cape Cod Bay on the north to Nantucket Sound to the south. 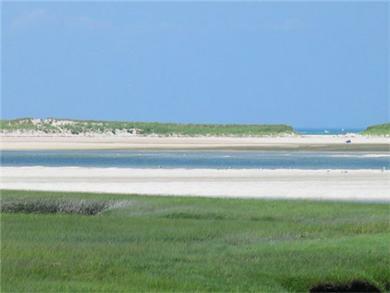 There are 100 miles of public beaches in Barnstable. Barnstable is located on the quiet north side along the shores of Cape Cod Bay. Both West Barnstable and Barnstable Village have retained much of their Colonial old world charm. They provide one of the most beautiful and historic stretches along Old King's Highway, Route 6A. Restored sea captains' homes, cranberry bogs, great salt marshes, Barnstable Harbor, and Cape Cod Bay are just a few of the interesting sights you’ll see as you pass through these towns. Sandy Neck, an eight-mile long barrier beach with dunes, beach grasses, and marshlands, is a favorite of sun worshippers. Centerville, with its maritime location on Nantucket Sound, was home to wealthy ship captains who built stately homes in the early 1800s. Located just 3 miles west of Hyannis near Wequaquet Lake, Centerville is probably best known for beautiful Craigville Beach, one of the most famous on the south shore, to which visitors flock for boating, beachcombing and, of course, swimming in warm Nantucket Sound water. Cotuit offers a combination of quiet residential and tourist oriented surroundings. Historic Cotuit Bay is filled with pleasure boats, secured to deep moorings and dancing in the sunlight, reflecting the heritage of this small village located off the beaten path. Dennis has coastline on both Nantucket Sound and Cape Cod Bay and offers some 18 beaches for summer enjoyment and fun. The villages of East Dennis, Dennis, and South Dennis feature scenic historic districts hailing back to whaling days, while tranquil tree-lined streets meander through Dennisport and West Dennis. Dennis had one of Cape Cod’s first industries, a salt works, the inspiration of Captain John Sears who, in 1776, devised a way to evaporate salt water. Hyannis is considered the "hub" of the Cape, with nearly 70% of the population in this area and is also home to the majority of Cape Cod’s industry, including Colonial Candle and Cape Cod Potato Chips. The downtown area of Hyannis is busy most of the year with many shops, restaurants and attractions such as the Melody Tent and the Cape Cod Railroad. The John F. Kennedy Hyannis Museum is a multimedia exhibit designed to open a window on the days JFK spent on Cape Cod at the family compound in Hyannisport. From the Ocean Street Docks, ferries and tour boats depart to the islands of Nantucket and Martha's Vineyard. Cape Cod’s daily newspaper, The Cape Cod Times, is published in Hyannis. Marstons Mills is an inland residential community. Although it has no ocean front, the Marstons Mills River provides access to Nantucket Sound, which made it the home of many mariners, including whalers, deep water masters, and steamboat captains. The town boasts several beautiful ponds and lakes and many cranberry bogs. Osterville, located on the south side, is primarily residential and, along with Oyster Harbor Beach, includes inlets and harbors for fishing and boating. Take a stroll along the village’s Main Street and pause to enjoy the art galleries, ice cream parlors, and boutiques. Yarmouth is another Cape town that stretches from Cape Cod Bay south to Nantucket Sound. It includes three villages: West Yarmouth, Yarmouthport, and South Yarmouth. Yarmouthport, on the bay side, is the most preserved area, with stately sea captains' homes located along Route 6A. West Yarmouth is commercially developed, while South Yarmouth offers sun, sand, sailing and antique shops. Yarmouth is a popular vacation destination with its fifteen public saltwater beaches, five freshwater beaches and two municipal golf courses. You’ll also find a children’s petting zoo, miniature golf, trampolines and many other fun family activities. Yarmouth is the second oldest town on Cape Cod and is filled with historic charm.